This particular attachment is for the Force USA MyRack ONLY. 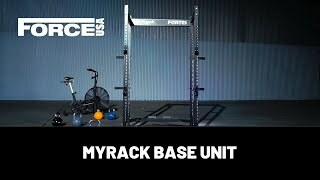 The Force USA MyRack Knee Holder is a must have attachment if you have added the Lat Pulldown option to your MyRack. The Knee Holder can be attached to either the MyRack Pine & Pipe saftey or can be used in conjunction with the MyRack Band Pegs. Simply by connecting the Knee Holder to one of these on either side of the rack, you can perfom lat pulldowns whilst bracing your knees securely under the foam padding. This is especially helpful when you are pulling heavier loads.